Australia’s No.1 Top Fuel Champion has been notably quiet since his spinal injury at last November’s East Coast Thunder championship round. Matheson injured his spine on his first pass at Sydney Dragway and was sidelined from further competition in Sydney. The defending Top Bike champion made the final at Rd 1 last July at Darwin’s Hidden Valley, only to not pick up any points at the Sydney round in November. This is a tough sport that shows no mercy,” said Matheson. One day you can be on top and the next fall down the ladder. Matheson lines up this weekend in Sydney hopeful to resurrect his points chase as he focuses on an unpreceded sixth national Top Bike title. 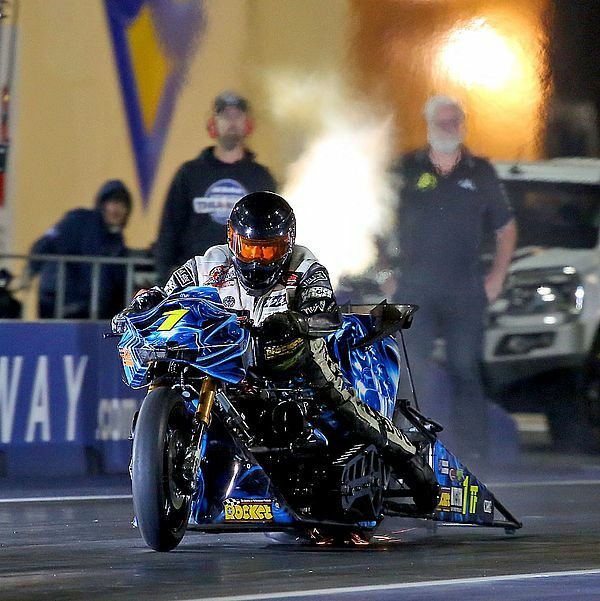 Matheson said he has been climbing the walls literally trying to recuperate to the point where his spine can withstand the forces and challenges a nitro-burning 1500 horsepower Top Fuel Motorcycle represents. “Certainly, the heart and mind are fine, however, the body is not as it was,” said Matheson. 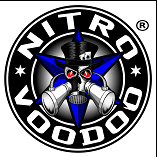 The Queenslander is confident he and his Nitro Voodoo crew will put up a fight and hopefully provide some stiff competition. “I’m super excited coming into Sydney as we have eight bikes in the field. That’s a first in our bracket for some time,” said Matheson. We are seeing a resurgence of Top Fuel motorcycle racing worldwide, and the effects are flowing through to Australia. “This weekend we have six four-cylinder bikes, and two V-Twin Harley-Davidsons. Normally it’s the four-cylinder bikes that are outnumbered by Harley’s. “Last round we saw the return of Jay Upton, and the final was a classic between Gavin Spann and local rider Adam Layton. I know that Gavin wasn’t planning to attend this event, but he’s got some championship points in the bank now, so I’m sure he will be pushing hard for another win. Layton, on the other hand, is nudging closer to the breaking the Australian V-Twin national record, and weather permitting he just may well do it this weekend,” said Matheson. “Newcomer John Zahra has made the long trip from North Queensland early to get in some test runs, which brings another fast bike to the mix. Matheson said,” We hold the track record at Sydney Dragway at 6.07 and will aim to re-set it this weekend, providing we can hook up and go. The weather no doubt is going to be tricky with high temps on Friday, however, Saturday is looking more comfortable in the high 20s. Autosport International Top Fuel dragsters, the AC Delco Pro Slammer, and Top Fuel Harley-Davidson of Adam Layton Motorsports. Come and say hi with LIVE streaming, ticket giveaways and autograph signing. Later that night the Australia Top Bike Group, along with Sydney Dragway will be hosting a welcome BBQ for all racers and crew at the Santo’s Summer Thunder event. “We did this last November in Sydney and it was quite successful, explained Matheson. “The purpose was to bring together racers for a relaxed social get together before the big race. So please drop over at 8 pm for a cold drink and a bite to eat. The BBQ will be located at the front of the pits near the Sydney Dragway scrutineering shed. Hope to see you there.